Preheat oven to 350°F. Boil pasta according to box directions. Drain and set aside. Rinse out pot so pasta is cleaned out completely, dry. Melt butter in same pot over low heat. Blend in flour, stirring constantly. After roux is well mixed, gradually stir in milk and cream. Turn heat to medium. Cook, stirring constantly, until mixture boils and thickens. Remove from heat, add pepper and grated cheese. Stir until cheese is melted. Stir in pasta and salt to taste. Place in a buttered casserole dish. Bake 25-30 minutes. If top browns too quickly, cover with foil. 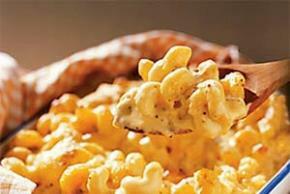 For more creamy shells 'n' cheese, cut baking time. Let stand a bit before serving.